Turning the first sod of soil today on a new $1.7 million affordable housing project in Armidale, Homes North tenant Gerry Widders, Northern Tablelands MP Adam Marshall, Homes North CEO Maree McKenzie, Home North Tenants Group President Annette Botha and tenant Paul Turbett. 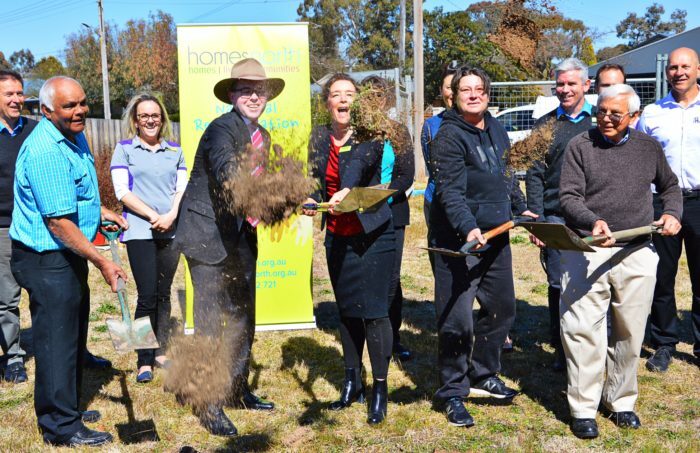 NORTHERN Tablelands MP Adam Marshall shared a shovel with Homes North’s CEO Maree McKenzie and local Home North tenants today to turn the first sod of soil on a new $1.7 million affordable housing development in Armidale. Mr Marshall said the Chapel Street complex was Homes North’s second affordable housing development in Armidale with the first $2.1 million complex in Stephen Street completed in May. “The first complex included six environmentally-friendly two and three bedroom apartments that are now providing long-term, budget accommodation to Armidale locals, while keeping energy bills low,” Mr Marshall said. Mr Marshall said Homes North recognised the importance of providing good quality homes that are affordable, accessible and adaptable for a broad range of people on low to moderate incomes. Homes North CEO Maree McKenzie said they were very happy with the positive outcomes from their first development in Stephen Street. “This new development is an important part of our planned growth to provide homes for single people and families to live affordably,” Ms McKenzie said. “Armidale is on the list of centres assessed by the NSW Government as needing more affordable accommodation and Homes North recognises the importance of providing good quality homes that are affordable, accessible and adaptable for a broad range of people on low to moderate incomes.